WE PURCHASSED HACKSAW FROM MARY GASKINS . WE PURCHASED THE ENTIRE PLANT. BORN IN THE DEEP SOUTH, HACKSAW HAS A SUPERB NORTHERN PEDIGREE. 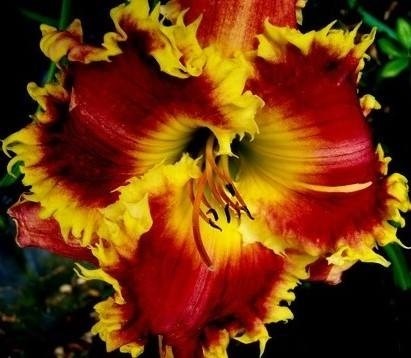 IT IS CREATING A SUPERIOR, GROW ANYWHERE, GENERATION OF TOOTHY EDGED DAYLILIES. WE HAVE SEVERAL FUTURE INTRODUCTIONS COMING FROM HACKSAW. 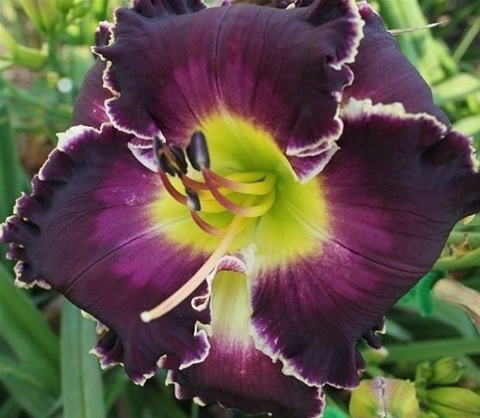 GREAT DARK PURPLE COLOR THAT HOLDS WELL THROUGH THE DAY. 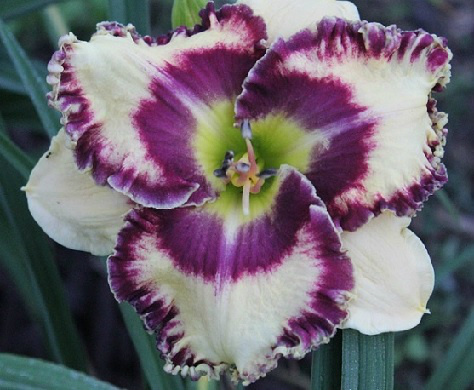 HAS A VERY NICE TOOTHY EDGE ON ALL FLOWER SEGMENTS AND A TRIANGULAR GREEN THROAT. VERY DARK PURPLE WITH SPARKLING WHITE TEETH ON BOTH PETALS AND SEPALS. IT IS ACCENTED WITH A BRIGHT GREEN THROAT. COLOR HOLDS WELL FOR ONE SO DARK. 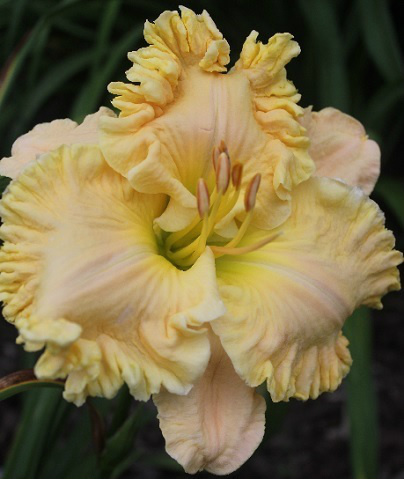 AVERY IS CREAM WITH A PINK BLUSH AND A PRONOUNCED YELLOW RUFFLE. AVERY'S RUFFLES DO NOT HANG. 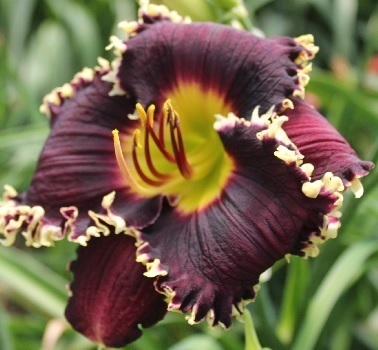 THE FLOWERS ARE LARGE AND THE VERY HEAVY SUBSTANCE MAKES THEM IMPERVIOUS TO SUN AND RAIN DAMAGE. EASILY FERTILE AND PROVING TO BE A FINE PARENT. CLEAR COLORS, TALL SCAPES, GOOD BUD PLACEMENT AND FINE FORM MAKE CAMRYN AN EXEMPLARY GARDEN SUBJECT. THE ABILITY TO PASS ON THESE TRAITS AND VERY GOOD FERTILITY MAKES HER A POWERFUL TOOL FOR HYBRIDIZERS. WE HAVE SEEDLINGS THAT WILL LIKELY GET A NAME THAT HAVE EVEN TALLER SCAPES AND 30+ BUDOUNTS. CAMRYN IS EMO AND NEVER FAILS TO OPEN PERFECTLY. 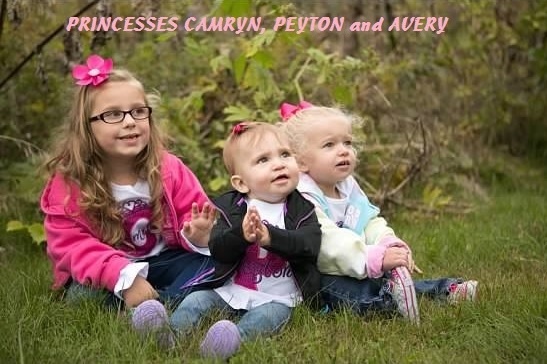 PEYTON HAS EXCELLENT SUBSTANCE AND CLEAR COLOR THAT HOLDS UP WELL IN FULL SUN. SHE IS AN EMO THAT DOES NOT HANG. 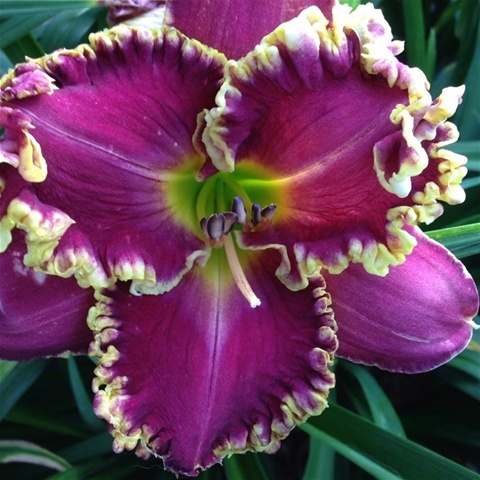 SIZE AND COLOR ARE CONSISTENT FROM FIRST TO LAST BLOOM. 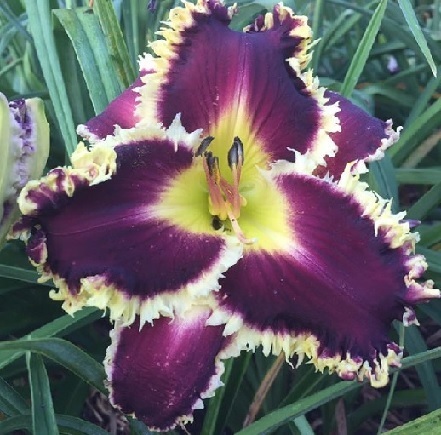 GOOD POD AND POLLEN FERTILITY AND A BRIGHT GREEN THROAT MAKE HER A VALUABLE TOOL FOR NORTHERN HYBRIDIZERS. GAVISH IS A RICH AND VERY DARK VIOLET WITH A LIGHTER WATERMARK AND A SILVERY-WHITE EDGE ON THE SEGMENTS. IT IS NOT PRONE TO WATER SPOTTING AND MAINTAINS ITS COLOR VERY WELL THROUGHOUT THE DAY FOR ONE SO DARK. IT IS A VERY EASILY FERTILE BOTH WAYS EVEN IN FULL SUN. NAMED FOR A FAMILY FRIEND, DR. GAVISH PATEL. 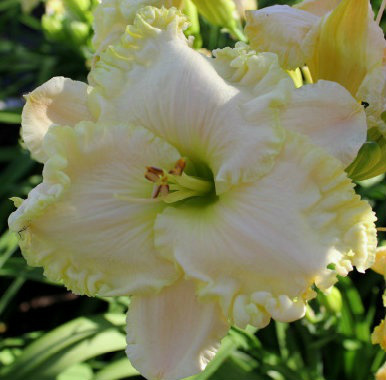 THE FINEST NEAR-WHITE IN OUR GARDEN AND WE HAVE SEVERAL NEAR WHITES THAT WE LOVE. 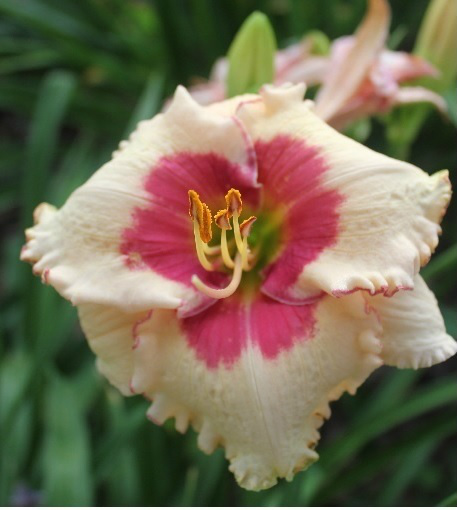 OLAF IS AN EASY OPENER WITH BIG VOLUPTUOUS BLOOMS ON TALL STURDY SCAPES FROM START TO FINISH. OLAF IS VERY FERTILE BOTH WAYS AND HAS REALLY BEGUN TO SHOW ITS PRODUCING POWER.